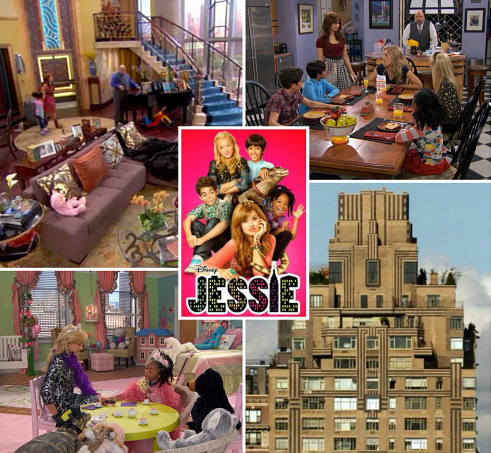 The Fabulous Family Penthouse on the Disney Show "Jessie"
Jessie Prescott moves to NYC to follow her acting dreams but ends up working as a nanny for a famous showbiz couple instead (think Brangelina). Movie producer Morgan Ross and his supermodel-slash-actress wife Christina live in a huge, jaw-dropping penthouse on the Upper West Side. We rarely see their parents Morgan and Christina Ross, who are played by Charles Esten (who’s probably too busy playing tortured Deacon Claybourne on Nashville) and Christina Moore. 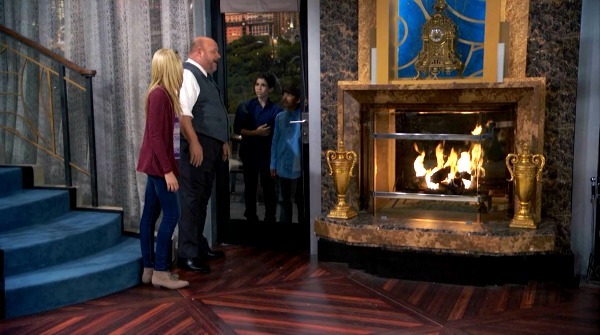 The kids are basically being raised by the butler Bertram (played by Kevin Chamberlin, a Tony-nominated actor) and their good-natured nanny Jessie (played by Debby Ryan, who you may remember from The Suite Life on Deck). Even the hallway is big! 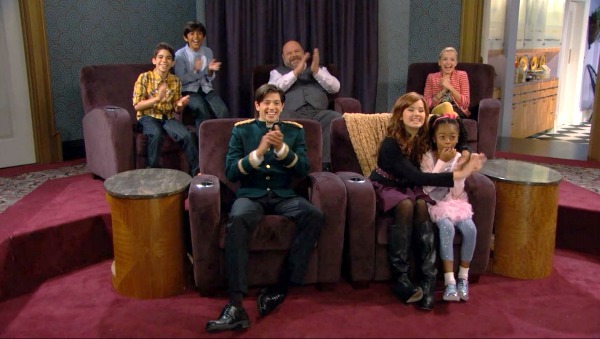 Karan Brar, the actor who plays Ravi, was born in the States. He worked with a dialect coach to learn the Indian accent he uses on the show. She has a sweet little swing in her room. What little girl wouldn’t love that? They put a traditional wood table with Windsor chairs in a purple kitchen that has contemporary and Art Deco details, but somehow it all works (at least as a set — not sure I’d try it at home!). 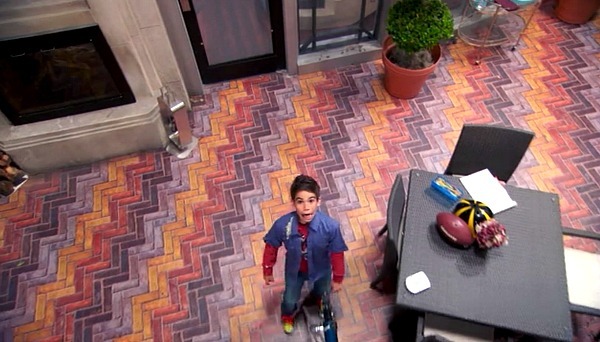 I watched the first two seasons of the show while taking these screenshots, and now the catchy Jessie theme song is stuck in my head! Thanks to Lily for helping me with this one! 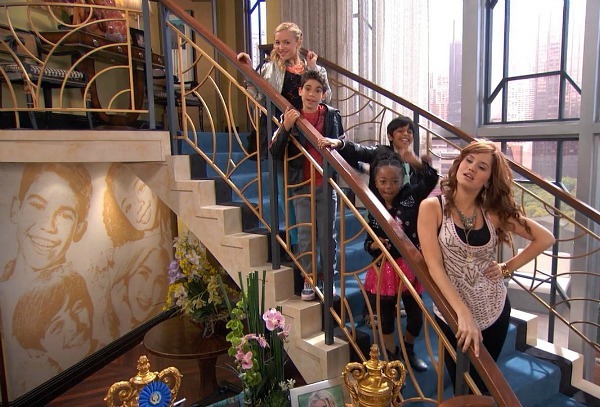 Are you (or your kids) a fan of the show? 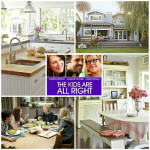 Inside the Real House from "The Kids Are All Right"
We watch it at our house. It is one of their shows that I don’t mind watching with them! 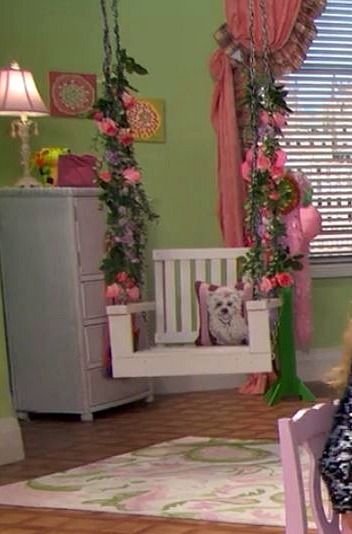 As many episodes as I have seen, I don’t remember seeing Emma’s room before! 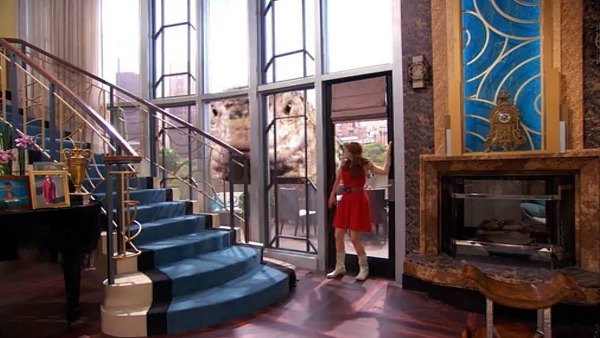 Can you imagine the cost if that penthouse was real!? 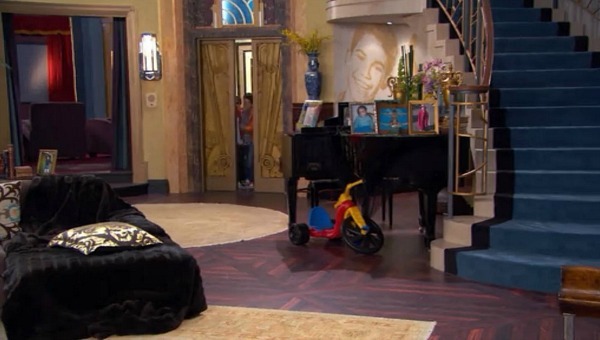 They don’t show Emma’s room very often. I only saw one episode in the first two seasons that did, and even then they didn’t show much of it! 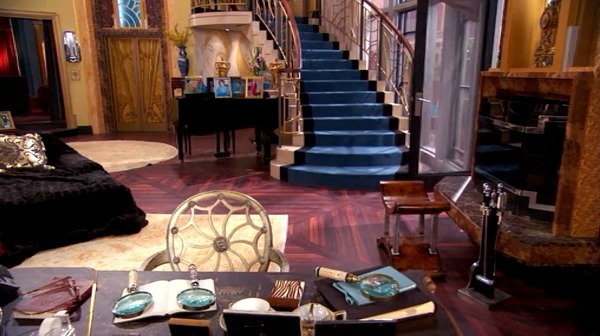 Although the spaces are extremely different, the set immediately reminded me of that show My Two Dads. Colorful and fun, and as a kid I wanted to live there! Remember that one? I forgot about that one, Stephanie! Wow! That was fun! Even though I don’t have children of the age to watch this show, I may just tune into Netflix myself to sample it. It really reminds me of a few shows from the 60’s, 70’s and 80’s all jumbled together. For instance, Different Strokes had the family living in a beautiful penthouse with a winding staircase, along with a successful father with his own daughter and two adopted African-American sons. Family Affair had a father with a teenage daughter who following the death of a relative adopted a nephew and niece. And to top it off they had an English butler played by Sebastian Cabot. Of course we all remember Full House. The parallels are amazing. Thanks for posting this…it was fun to see. You’re right, Anita! I loved watching “Family Affair” reruns after school when I was a kid. 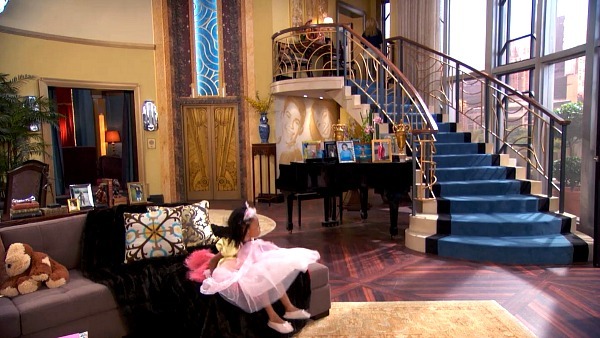 It also reminds me a little of “The Nanny” in the ’90s. Thanks! Our grandkids got us watching, but only when they are here! We actually enjoy watching with them. 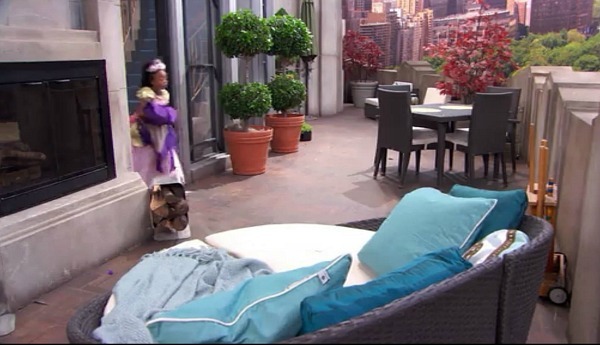 The penthouse is a bit bizarre, but I love the balcony outside, and the theatre room! 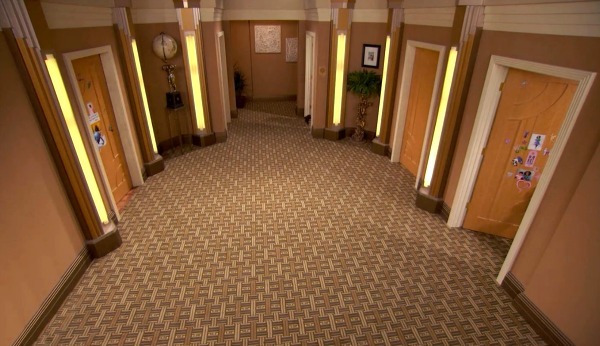 I’m sorry, but I just find this apartment ghastly. I love color and I love Deco. But there is almost nothing I like about this except: the living room windows (kinda), the elevator doors (a lot), and the exterior of the building. Nevertheless, I enjoy looking. So please keep these unusual posts coming. Why do I have a suspicious feeling this show is not very good. Probably depends on who you ask. I read that it’s one of the most popular shows on Disney, so a lot of kids love it. 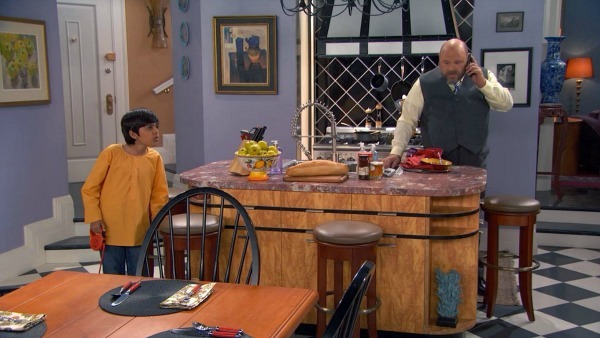 I’m not sure it appeals to as many parents as “Good Luck Charlie,” for instance, though (my personal favorite). I had to watch some of these episodes on “mute” while I was taking the screenshots because the kids on the show started getting on my nerves. Ha. Never saw the show but from these pictures it all looks like a vomit mess! Sorry! 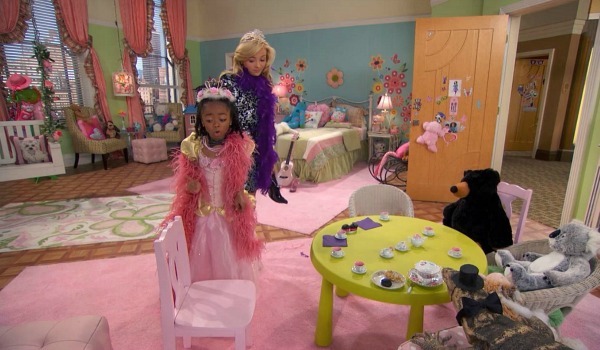 And, the premise of the show really feeds the fantasy most kids have today of living like all the folks they see on tv – not my cup a tea! It is a very colorful set. Not how we’d probably live, but hey, I like that they went out on a limb. I happen to watch the show with my eight year old. It’s actually quite funny for the kind of show it is. A lot better than many of the kid shows out there right now. You’re right, Liz! I see the resemblance now that you mention it. Love the show, I want to know more about the face photo of the kids in sepia that covers the wall, what is the name of that technique, where can I have those make? thanks. 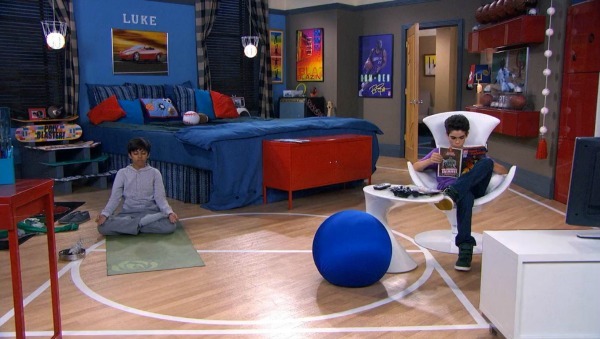 where do you get luke’s bed? how can i find out the type of fabric used on their dining room chairs?